Home / Support a Classroom. Build a Future. It's a simple statement with a big impact. AND it can be a simple action with a big impact. Join Whitridge Associates in supporting DonorsChoose.org, an organization that supports teachers and students across the country by helping to fund classroom projects with donations. In an article published in USA Today, 94% of public school teachers reported they spent their own money on the simplest of supplies for their students, including notebooks and pens. Their out of pocket expenses came in at an average of $479 a year. DonorsChoose.org aims to quell those rising out of pocket costs by connecting you with teachers in need of assistance. No amount is too small (or too large! - just to be fair), you can watch your dollars go directly to teachers who would normally pay for projects out of their own pockets, when educational funding through the schools just can't meet their students' needs. At Whitridge Associates, everyone from our COO to our IT Recruiters to our interns have opened their wallets to donate to teachers like Ms. Coyle, a teacher in an area of need in Houston, Texas, who reached out to us via Twitter to tell us about a project she was trying to get to the finish line for her kindergarten students. The Whitridge team banded together over the course of one work day, between recruiting efforts and onboarding new IT consultants, to propel her to her fundraising goal. It only took a little effort from an IT staffing firm in Quincy, Masssachusetts to help a teacher and her students across the country. We'll probably never know how many children it will impact in the future, but boy, does it feel good. 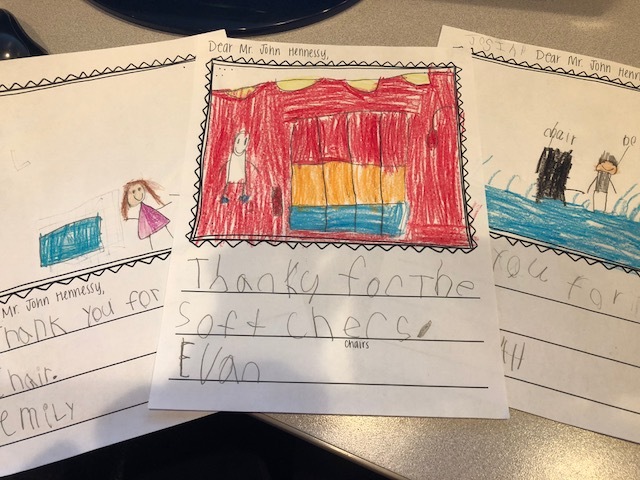 Every time we receive another large white envelope filled with colorful thank you's, hand written from the students, we know we've made an impact and we hope you'll join in the movement. In June 2018, Whitridge took on a social media initiative - for each new follower we gained on LinkedIn and Facebook, we would donate $2 to DonorsChoose.org. With the support of our clients, consultants, internal staff, and friends we were able to create quite the buzz, gaining 707 followers over the month bringing our total donation to $1414.00! With that impressive amount we were able to donate to 15 different teachers, completing 13 projects and getting 2 projects closer to their goal in 11 states! We are so proud to be able to help out the teachers that are shaping the minds of the leaders of tomorrow. Thank you very much for your generosity. I really appreciate that you took interest in my classroom project and helped me reach my goal. I am very grateful that your company cares about the learning environment of my students. The addition of standing desks to the classroom is very exciting for my students. I know that the desks will be very popular and will help facilitate collaboration. Thank you again for all of your help. After a short 3 days of creating this project for Flexible seating for my students, I am excited to announce to you all that I have met my goal! None of this would have been possible without your generous support and donation. I didn't expect my goal to be met as quickly as it did, but that just shows how many of us still see the value in public education for our children. As the wise saying goes, "it takes a village to raise a child." My students and I are grateful to have a village of supporters that believe in them and their futures. Please know that you made a difference and we appreciate you all! Thanks to your generosity my project, "Turn Up the Volume on Reading!" Is FULLY FUNDED! I am SO very thrilled to be able to provide this learning resource to my students this year and many years to come! I cannot wait to show you pictures of the smiles on their faces because most (not all) have never experienced a book on CD via a listening center before. I am absolutely thrilled and fortunate for your support. I cannot wait to see the faces of students as they learn to code. Without your help they would not have this chance! Thank you for giving to my project. I cannot express my appreciation and thankfulness for believing in my project. Students in my upcoming class as well as others need to be exposed to new experiences and I am so excited you will be a part of their learning. If you want to give to DonorsChoose.org, please visit their website, HERE. This blog post was written by Danielle Larson, Social Media Coordinator at Whitridge Associates. DonorsChoose was started by a history teacher. In 2000, Charles Best, a teacher at a Bronx public high school, wanted his students to read Little House on the Prairie. As he was making photocopies of the one book he could procure, Charles thought about all the money he and his colleagues were spending on books, art supplies, and other materials. And he figured there were people out there who'd want to help — if they could see where their money was going. Charles sketched out a website where teachers could post classroom project requests, and donors could choose the ones they wanted to support. His colleagues posted the first 11 requests. Then it spread. Today, we're open to every public school in America. Find a classroom project that inspires you and give as little as $1. We're a public charity, so your donation is tax-deductible. When a project is fully funded, we purchase all the requested items and ship them directly to the school. Every donor gets a thank-you letter from the teacher, photos from the classroom, and a report of how each dollar was spent. Whitridge Associates, an IT Staffing and Engineering Staffing Firm, provides expert talent to a diverse group of technology companies, financial services, defense contractors, engineering firms, and healthcare providers throughout the country. With a history of 25 plus years of unparalleled IT staffing service to both our clients and consultants, Whitridge is one of the most highly regarded IT and Engineering staffing firms in New England. Whitridge was recently recognized as an Inavero’s Best of Staffing® Client and Talent Awards winner, one of the top 100 fastest growing staffing companies in the United States and was presented with The Excellence Award from TechServe Alliance the industry’s leading trade association.